Villa Sierra Blanca is located 5 minutes from Marbella and Puerto Banus; the villa has an amazing panoramic view of the Mediterranean and features 3 floors, a large garden and heated pool. Ground Floor: Main entrance hall Guest toilets with dressing room, large lounge, covered terrace, dining room, TV room in Moorish style (large flat TV screen with home cinema surround sound system), 1 guest room with en-suite bathroom, extra-large kitchen (capacity of 8 people) fully fitted with top quality Gaggenau domestic appliances. First Floor: 1 large master suite with walking wardrobe and large bathroom with Jacuzzi, large terrace, 2 other bedrooms with en-suite bathrooms. Basement: 3 bedrooms, 2 bathrooms, cinema room and large garage (3 cars). Including 4 hours cleaning Monday-Friday. The apartment Sierra Blanca Villa is located in Marbella area. 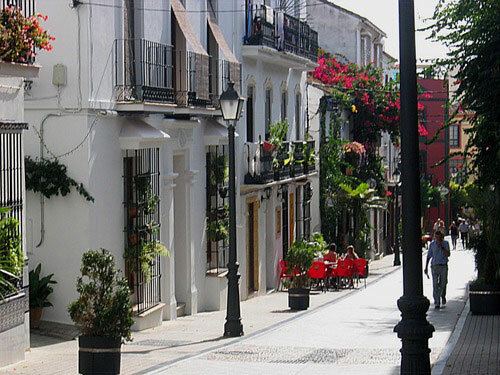 Sierra Blanca is an urbanization located 300 meters above sea level overlooking the Mediterranean Sea. Luxury villa situated in the prestigious residential area of Marbella, Sierra Blanca. This Villa features 3 floors, garden with swimming pool, tennis court and an amazing panoramic view to the Mediterranean.